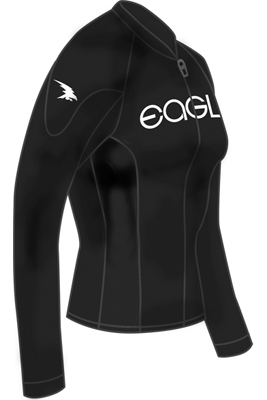 The women's Freeflex Heater shirt represents Eagle's evolution of the standard heater shirt. This popular shirt is now available for the women in front zip and is manufactured to be the ultimate in comfort. For 2013, we have made a few enhancements. We have added smooth rubber seal on the neck collar and at the wrists. The wrists are now designed to allow your gloves to fit over top instead of having to push the sleeve up your arm.